Salesforce.com, a leading CRM software provider, has experienced outstanding growth in recent years. Over the next four years, the company plans to double its current revenue to $20 billion to $22 billion annually. Salesforce (NYSE:CRM) announced recently the lofty goal of $60Billion revenue by 2034. Salesforce market consolidation is projected to be $82B by 2025 and growing at 15% yearly rate. International expansion, innovation, and acquisitions will lead the way for future revenue growth. High valuation multiples and growth expectations put the company in a precarious position in the long term. 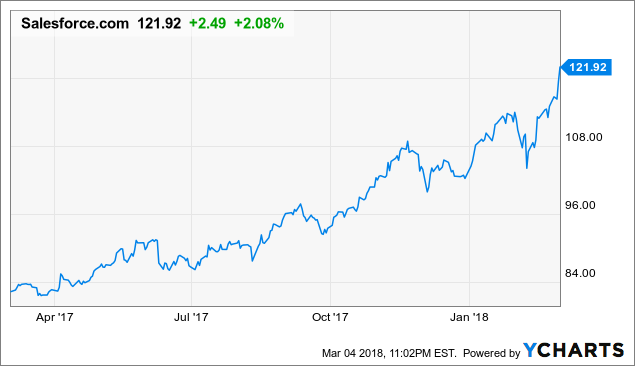 Salesforce stock is delivering impressive performance on the back of strong top line momentum. The company is a market leader in cloud-based CRM solutions, a promising segment offering abundant potential for growth. Upside Q1 guidance has revenue from $2.925B to $2.935B (consensus: $2.9B) and EPS from $0.43 to $0.44 (consensus: $0.37). Upside FY19 guidance has revenue from $12.6B to $12.65B (consensus: $12.55B) and EPS from $2.02 to $2.04 (consensus: $1.75). Key metrics: Subscription and support revenue, $2.66B (+26%); Professional services and other revenue, $196M (+7%); operating cash flow, $1.05B (+49%); total operating expenses, $2.04B; cash and equivalents, $4.52B; deferred revenue, $7.09B (+28%); unbilled deferred revenue, $13.3B (+48%); total current and noncurrent debt, $1.72B. CWEB Analyst’s have initiated a Strong Buy Rating for Salesforce (NYSE:CRM) and a Price Target of $220 within 12 months.